Palm View Animal Hospital is an affordable, full-service veterinary practice. With over 20 years experience in the veterinary field, Dr. Christie Waldie-Torres understands how important the human-animal bond is and strives to keep your pet happy and healthy for many years to come. Alexandra Davis, was born in England and raised in Alexandra Davis, was born in England and raised in School, Wolmer’s Girls’ High School and the University of School, Wolmer’s Girls’ High School and the University of the West Indies (UWI) obtaining her BSc. Degree in zoology the West Indies (UWI) obtaining her BSc. Degree in zoology and chemistry at their Mona campus. and chemistry at their Mona campus. She has spent most of her life in public service having She has spent most of her life in public service having worked for the Ministry of Agriculture in Kingston, Jamaica, worked for the Ministry of Agriculture in Kingston, Jamaica, The Capital Taxes office in London, England and MiamiThe Capital Taxes office in London, England and MiamiDade County Government in Florida. Dade County Government in Florida. In keeping with her heritage, she created a non-profit In keeping with her heritage, she created a non-profit organization called Caribefest, Inc. in 2003 to foster organization called Caribefest, Inc. in 2003 to foster diversity, tolerance and unity in the Miramar community, diversity, tolerance and unity in the Miramar community, whose Caribbean population was growing exponentially. whose Caribbean population was growing exponentially. The efforts of this organization created a Caribbean The efforts of this organization created a Caribbean cultural festival in the City of Miramar called ‘Caribefest’ cultural festival in the City of Miramar called ‘Caribefest’ where the various cultures of the Caribbean converged where the various cultures of the Caribbean converged with the sights, sounds and tastes of the islands. with the sights, sounds and tastes of the islands. Over Over the the years, years, she she has has served served on on various various Miramar Miramar boards boards including the Planning and Zoning Board, including the Planning and Zoning Board, the the Community Community Services Services Board Board and and the the Education Education Board. Board. In In 2010, 2010, she she ran for the office of Miramar City Commission, ran for the office of Miramar City Commission, following following her her passion passion of of public public service service and and from from aa field field of of six six other other qualified candidates she was victorious and was qualified candidates she was victorious and was sworn sworn in in as as aa City City Commissioner. Commissioner. She became the Vice Mayor in 2013 and worked on She became the Vice Mayor in 2013 and worked on numerous initiatives whilst in office such as creating a numerous initiatives whilst in office such as creating a Youth Apprenticeship program, proposing the building of Youth Apprenticeship program, proposing the building of the community band-shell as well as the police substation the community band-shell as well as the police substation in the eastern/historic section of Miramar, ensuring all in the eastern/historic section of Miramar, ensuring all schools had school resource officers to include public schools had school resource officers to include public charter schools and legislating that seniors who qualified charter schools and legislating that seniors who qualified no longer paid City taxes. no longer paid City taxes. As a certified teacher she was compelled to form a nonAs a certified teacher she was compelled to form a nonprofit 501 (c) (3) in 2015 called the Caribbean American profit 501 (c) (3) in 2015 called the Caribbean American is “Inspiring Students and Empowering Teachers” and is “Inspiring Students and Empowering Teachers” and Alexandra has received many accolades and awards such Alexandra has received many accolades and awards such as ICABA’s one of South Florida’s 100 most accomplished as ICABA’s one of South Florida’s 100 most accomplished Caribbean Americans; Legacy Magazine’s one of the 50 Caribbean Americans; Legacy Magazine’s one of the 50 most powerful and influential business leaders in South most powerful and influential business leaders in South Florida; Florida; Jamaica Jamaica Consul Consul General General Jamaica Jamaica 50 50 Luminous Luminous Award; Legacy Magazine’s one of South Award; Legacy Magazine’s one of South Florida’s Florida’s top top educators. educators. PUBLISHER’S INSIGHT 8	Inside Miramar, Reaching All of Miramar and Print Isn't Dead CITY OF MIRAMAR: 2019 SUMMER CAMP GUIDE 10 - 11 A camp for every kind of kid CITY OF MIRAMAR: MEET YOUR CITY MANAGER 12	Meet Vernon E. Hargray BUSINESS BLOG - A DOUBLE FEATURE 14	Ishi Lima; A Family Affair FUN!tastic Times at Camp Lingua PETS ARE PEOPLE TOO 18	See this issue’s Furry Friend. Enter to win, your pet could be featured next! 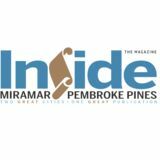 n the last issue I kind of teased everyone with the pending news that Inside Miramar was going to be mailed to every home and business in Miramar starting with the next issue. Well, the next issue is here and we are now reaching all of Miramar. For the first time, all of the residents in the City will be received an informative, timely, entertaining, and business driven magazine at the same time. Ι am so thrilled that so many of the staple businesses that started with us a year ago continue to advertise in the magazine. We also added 13 new businesses to this issue. The need to advertise and promote your company is alive and well. There is a misconception that print is dead or on it’s last leg and that online is the end all be all for advertising. I say, “not so fast”, print in particular is extremely important because in many cases it becomes the trigger point for you to read, research and react. A reader sees an advertisement or something going on in the City and then follows up by going to that particular company or City website and getting more information and then hopefully becoming a customer or attending various City events. It’s also vital to hear from our key City officials. They will continue to use Inside Miramar as a resource with the intent of bringing you the information you need to know every 45 days. Before we know it, school will be out and summer will be here. Enjoy the spring and Mother’s Day feel to this issue of Inside Miramar in the city you call home. I hope you take the time to read up on the great things happening in the City as well as all of the Summer Camps you will find in this issue. Because Our FuturE Shines bright! SUMMER SPORTS & M.O.S.T. CAMPS Includes field trips and meals. SUMMER SWIM CAMP Includes field trips and meals. Space is limited. Call today for rates and availability! miramarvels summer camp Includes all meals and activities. Space is limited. Call today for availability! Miramar Cultural Center is thrilled to introduce an exciting theatre arts program for 8 th through 12 th graders who desire a deeper under Jo Marie Payton Personality, Actress, Singer and Director) students will engage in production. | Space is limited. Only 35 openings available. Call today for availability! ernon E. Hargray is an accomplished administrator and consummate professional with over 40 years of progressively responsible municipal management experience. Hargray’s extensive public service background includes project management; contract administration; capital project development; financial strategic planning implementation; revenue enhancement and leveraging assets. ter, located at 7000 Miramar Parkway, was renamed the Vernon E. Hargray Youth Enrichment Center as proof of these accomplishments. Hargray’s ambition is also responsible for over $300,000,000 million in Capital improvement work that has strategically shaped and molded the livability of various communities. A Florida native, Hargray holds a Bachelor’s Degree from Florida A & M University in Tallahassee, Florida and a Master’s Degree in Education from Georgia State University. Hargray is also a Veteran 1st Lieutenant of the United States Army; honorably discharged in 1981. Also heavily involved in his church, Hargray is the chair of the Finance Committee. Hargray has been married for over 40 years and has one son, a daughter-in-law, and a grandchild. City Manager Hargray is proud to serve the City of Beauty of Progress and is excited to show you why Miramar is the RIGHT PLACE to live, work, play and prosper. Remember, It’s Right Here In Miramar™ and so are YOU! Our Grand Opening Special Featuring Woody’s Signature Baby Back Ribs Just 16.99 Earn Woody’s Points with Every Purchase. Trial Class Call Today For Details! Limit One Per Customer. Discount Applied On Final Sale. amp Lingua is a unique Language Summer Camp and Dual Language After-Care Program where children enjoy an enriching, fun experience while developing language and critical thinking skills. Smile of Your Dreams Michael Gorman, DMD, earned his dental degree from the University of Florida College of Dentistry, after attending the University of Florida, where he received his Bachelor's of Health Science degree in Rehabilitation Counseling. Dr. Gorman obtained his certification in IV Concious Sedation from the University of Alabama at Birmingham and received extensive training in dental bone grafting and surgical implant placement and restoration in Miami, Florida, from one of the foremost dental implant experts in the nation. A native of Tallahassee, FL, Dr. Gorman enlisted in the U.S. Navy immediately after graduating high school, and is a Desert Storm veteran who served a four year enlistment. His cumulative dental knowledge, including general, cosmetic, implant, IV and oral sedation dentistry, affords Dr. Gorman the ability to complete a full-mouth restoration in a single visit by sedating patients comfortably, providing them the opportunity to walk into the office with virtually no fear or anxiety, and leave with a new smile without having any recollection of the procedure. Dr. Gorman utilizes Botox and Dermal fillers to compliment cosmetic dental procedures, which makes for the best possible esthetic outcome. OUR SERVICES IV Sedation Implants Full Mouth Reconstruction Botox & Dermal Fillers Invisalign Cosmetic Dentistry Looking forward to helping you with ALL of your dental needs! s I indicated many issues ago, and unfortunately I was correct, the Miami Heat and Florida Panthers would spend most of the year chasing the 8th seeds in their perspective leagues and “Yes” both missed out on reaching the Playoffs. This has become a very familiar theme in the South Florida sports landscape, “No Playoffs for You!” The Dolphins and Marlins are in a rebuild, see year 2021 if we are lucky before we watch another playoff game or series. The Panthers seem to have all the talent in the world but every year start off slow, make a run but fall short. Maybe the hiring of new Coach Joel Quenneville who is reunited with Dale Tallon, can recreate the success they had together in Chicago. It better work, they paid him a lot of money and this Hockey Club has an excellent core of offensive players like Aleksander Barkov, Jonathan Huberdeau, and Mike Hoffman. This young Panthers team shouldn’t be fighting to get into the playoffs; they should and better start fighting to be an elite team in the East. In my option, the Heat underachieved this season. Injuries were one of the reasons why but this team still had plenty of depth and young talent to at least make the playoffs. It was wonderful to see all the National love for D - Wade but missing the playoffs in his final season is very disappointing. The Marlins and Dolphins are on similar long term rebuilding paths. The Marlins have grabbed as many young pitching prospects as they could with the trades they have made the last few years as they let all their stars leave town. The Dolphins are likewise stockpiling as many draft picks as they can the next few years and have FINALLY decided not to spend big money on free agents and have moved away from Quarterback Ryan Tannehill after 7 subpar years. I do have the patience for both rebuilds but they MUST hit on their prospects and draft picks or our sports town will continue to be the, “No Playoffs for You!” sports market. Hurry and beat the crowd. ax reform measures are enacted frequently by Congress, which makes it hard for U.S. taxpayers to know which deductions are currently available to help lower their tax liability. Taxpayers may be able to take deductions for student-loan interest, out-of-pocket charitable contributions, health savings account, home mortgage interest, contributions to a traditional IRA, and deductions for self-employed taxpayers (SE tax, SE health insurance, SE qualified retirement plan contributions). Of course, some tax deductions are limited or disappear as adjusted gross income increases. Another key deduction is unreimbursed medical and dental expenses. The adjusted gross income (AGI) threshold for deducting unreimbursed medical expenses was retroactively reduced from 10% to 7.5% for tax years 2017 and 2018 only. In 2019, you may only deduct medical and dental expenses to the extent that they exceed 10% of your AGI and were not reimbursed by your insurance company or employer. Home mortgage interest has several modifications. The Tax Cuts and Jobs Act of 2017, enacted Dec. 22, suspends from 2018 until 2026 the deduction for interest paid on home equity loans and lines of credit, unless they are used to buy, build or substantially improve the taxpayer’s home that secures the loan. 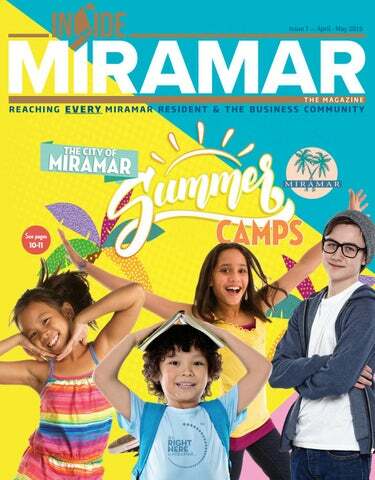 Inside Miramar is the LARGEST local circulation magazine in Miramar. REACHING OVER 45,000 RESIDENTS & BUSINESSES every 45 DAYS 8 issues mailed per year. You can change your ad with each and every new issue. DON’T HESITATE...Start YOUR AD CAMPAIGN TODAY! At NO COST...We can handle all your creative art designs. WE CARE! ADULT DAY CARE The City of Miramar Southcentral/Southeast Focal Point Adult Day Care Center provides supervised care to adults 18 years of age or older in a supportive and safe environment. The program provides services that include therapeutic activities, nutrition, health and personal care, medication management and transportation. MIRAMARVELS EARLY CHILDHOOD ACADEMY • Provides care for children ages 3 months through 5th grade. • to all children enrolled. • Provides VPK and accepts school readiness funding from Broward County Early Learning Coalition, the Early Learning Coalition of Miami-DadeMonroe and earned the Accredited Professional Preschool Learning Environment (APPLE) designation. SENIOR SERVICES • Offers stimulating educational classes as well as health and wellness activities. Provides a safe place to meet other active, resilient older adults. • Offers a way to conveniently access multiple public services in one location. Coordinates local and out of town group excursions. • Recognized as 2017 Healthy Weight Community Champion by the Dept. of Health. • Partners with Meals on Wheels of South Florida as a congregate meal site. Youth and Family Services • Provides utility assistance including electricity, water, and equipment for adults 60 years of age or older. • Assists in the application process for SNAP, Medicaid and Cash Assistance. • Provides information and referral services for residents under the age of 60. • Serves the community with experienced and caring social workers. Provides individual and group counseling for residents of Broward County. Miramar Multi-Service Complex On this day we celebrate at the City of Miramar Southcentral/Southeast Focal Point National Volunteers week. “National Volunteer Week, April 8-14, 2019, is about inspiring, recognizing and encouraging people to seek out imaginative ways to engage in their communities. It’s about demonstrating to the nation that by working together, we have the fortitude to meet our challenges and accomplish our goals”. Miramar Multi-Service & Sunset Lakes Senior Center Join us along with the Early Childhood Program for an egg decorating celebration to commemorate Spring. Miramar Regional Park Police and community stakeholders along with our seniors celebrate to kick of the beginning of Spring. inter is now over and it is time to start enjoying our water activities again. We would like to remind everyone of some safety tips to ensure a safe and enjoyable time in the water. Remember, not only do many homes here in South Florida have pools, but we also have many bodies of water including lakes, canals and of course the ocean. Each of these have their own safety concerns and should not be taken lightly. Drowning is the leading cause of unintentional death among children ages 1 to 4 and can be completely preventable. Let’s start with pools. Whether you own one or are using a community pool, the rules are the same. • Never swim alone. Have a buddy with you or make sure a lifeguard is within eye sight. • NEVER leave a child alone near water and never leave a child with another “older” child. If your child is missing and you live near water, check the water first!!! • Remember things like water wings, floats, swim boards and noodle are toys. Although they can aid you in swimming, you should never rely on them completely. • Ensure children and or guests follow rules like “no diving” or “no running” around the pool. Often, the concrete becomes wet from water that has splashed out of the pool and someone can easily slip and become injured. Barriers around the pool are extremely important. Make sure if you own a pool that not only is it secured, but that it has approved barriers around it. Many children who drown in home pools were only out of their parents’ sight for less than five minutes. If you are not sure if you have appropriate barriers, a quick call to code enforcement or an internet search will get you all the answers you need. WE WILL FOCUS ON THE PROPER FUNDAMENTALS OF THE GAME. SPEED AND CONDITIONING, PITCHING, CATCHING, HITTING AND MUCH MORE WITH THE BEST TRAINERS IN THE BUSINESS. Advanced Care At SPINALWORx Chiropractic and Medical Centers, we value the health and well-being of our patients. We have been at this location for 10 years maintaining a cost effective approach to healthcare. Our office has the latest in diagnostic testing, electronic charting, and state of the art facilities that allow us to provide the most advanced treatment for injury and pain. NEW PATIENT SPECIAL This coupon entitles you to a consultation, examination, and therapy. New patients only. This offer does not apply to auto accidents, personal injury or workman’s compensation injuries. This coupon has no cash value and is not valid with any offers. Offer expires 05/31/19. Happy Motherâ&#x20AC;&#x2122;s Day from your friends at Brokers Choice Realty. Thereâ&#x20AC;&#x2122;s only one choice, Brokers Choice Realty. Simple Real Estate Expertise. Let us show you how we can save you thousands of dollars on selling costs. Most agents never talk about this but you deserve the best deal you can get. Ask about our flex commission plan. ,LLC Inside Miramar The Magazine published by Inside Publications, LLC.